Chicago's Labor Beat on August 3, 2010, announced that it has just released its latest study, 'Corporate Media and the Pillage of Public Education.' The video, which is 27 minutes long, features Chicago Teachers Union President Karen Lewis, CORE teacher Carol Caref, and Substance editors and reporters George Schmidt and John Kugler in an analysis of how Chicago's corporate media work to spin "news" reports according to corporate agendas. The Labor Beat video, which is 27 minutes long, exposes how reporters from Chicago's corporate media try and set the agenda by narrowing the questions they ask of union leaders. 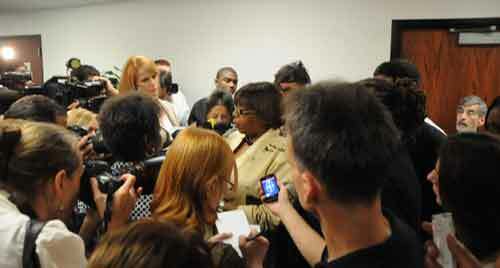 Above, during the June 15, 2010 Chicago Board of Education meeting, outgoing Chicago Teachers Union President Marilyn Stewart refused to allow reporters from Chicago's daily newspapers to pose the dichotomy between "union concessions" and "higher class size" that Ron Huberman and the Board of Education had just posed. Stewart, as shown in the video, finally told the reporters who were badgering her that it was ridiculous to try and answer questions that didn't reflect reality. Substance photo by George N. Schmidt.The video shows in stark terms how reporters for Chicago's corporate media, including the Chicago Sun-Times and "public television" WTTW, simply followed the lead of Chicago Public Schools officials on the question of whether by June 2010 CPS still had a massive 'deficit' and the teachers therefore faced a choice between higher class sizes and foregoing their contractually guaranteed raises. Central to the video are actual news films of reporters interviewing union leaders. After an introduction showing the huge CTU demonstration (held on May 25, 2010) at Chicago's City Hall, he video opens with the dramatic events of June 2010, when the Chicago Board of Education held an emergency meeting on June 15 to declare that they had to raise class size because of a "deficit". The video shows the large number of teachers who came out that day for a protest at 6:00 in the morning before going to work in their classrooms. The main focus of the video, though, is on how reporters for Chicago's corporate media frame their questions, ignore many facts, and follow what amounts to a script that has more to do with an editorial bias than with getting the facts. Following their remarks to the Board's meeting, a large press conference held outside the Chicago Board of Education's chambers on June 15, 2010, by outgoing CTU President Marilyn Stewart and incoming union President Karen Lewis (who had defeated Stewart in a runoff election just four days earlier, on June 11, 2010). Are you going to make concessions and forego a raise or force the Board of Education to lay off or fire hundreds of teachers and raise class sizes? Both Stewart and Lewis insisted that there were more than two choices, but the reporters simply continued asking the same question over and over. Over the course of the next few days, reporters, who had never asked Chicago schools CEO Ron Huberman to present the details for his claim of a huge budget "deficit", badgered union leaders by repeating the same simplistic formula question: Are you going to sacrifice teaching jobs and allow the Board to raise class sizes because you won't give up your contractual raise? 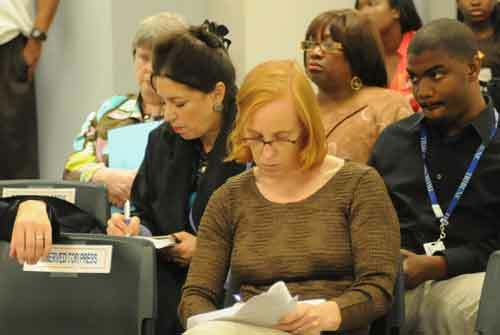 Earlier, at their June 15 meeting, the members of the Board of Education had admitted that they had the funds to pay the raise, which is based on a contract the Board agreed to in 2007 and which does not expire until 2012. Even the most blatant distortions and lies are reported as facts by Chicago's corporate media reporters when those lies are told by members of the Chicago Board of Education and high-ranking public officials. Above, the chart that stood in front of the Board of Education during the June 15 special meeting claimed that citywide teachers were central office "citywide administrative offices..." Not only was that not true, but the claim that by June 15 CPS was still facing a "deficit" of more than $400 million was equally untrue. 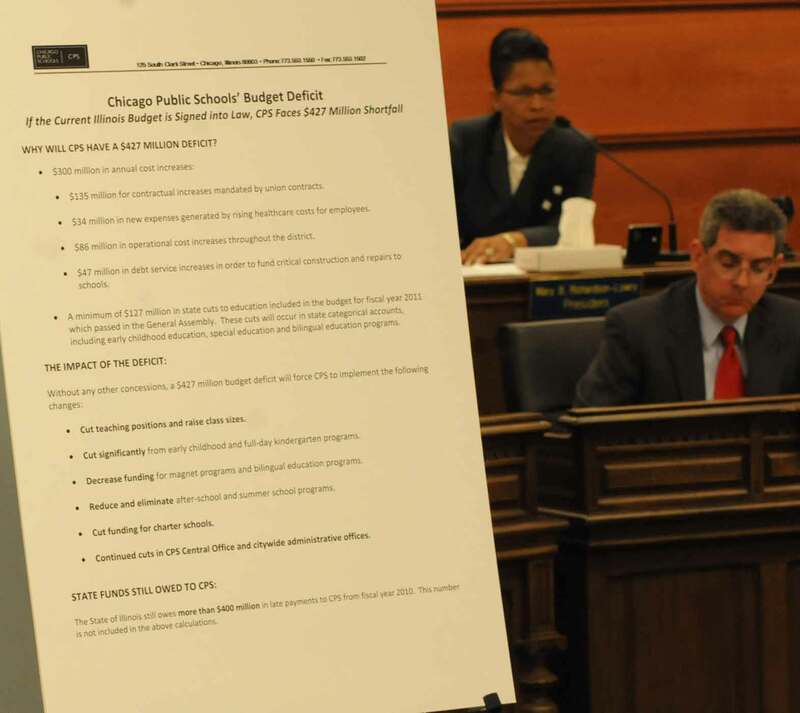 Not one reporter for Chicago's corporate media ever demanded that Ron Huberman explain where his budget "deficit" numbers came from between January 19 (when Huberman first delivered a Power Point claiming a massive deficit of nearly $900 million) and the June 15 Board meeting. Substance photo by George N. Schmidt.In the weeks following the election of Karen Lewis as the new Chicago Teachers Union President, we see how Chicago's corporate public relations world attempts to spin the story of new union militancy in the face of layoffs and 35 students per classroom. Exclusive press conference scenes and analysis. Interview with Carol Caref, new CTU Region A Vice President, as we watch her and Karen Lewis spar with reporters. George Schmidt, Editor of substancenews.net, provides valuable insights into the media scene in Chicago. Also footage and commentary by substancenews.net reporter John Kugler who describes his question that shut down a press conference put on by Mayor Daley and the head of Chicago Public Schools Ron Huberman. 27 min.